Budget credibility describes the ability of governments to accurately and consistently meet their expenditure and revenue targets. When governments fail to implement budgets as planned, real costs are incurred. For example, the economy may be negatively impacted by deficits that are larger than forecasted, or health and education services may be compromised. However, governments may have good reasons to deviate from their original budgets, especially when macroeconomic shocks disrupt plans, or government managers realize that there are better and more efficient ways to provide services. The study of budget credibility examines the extent and nature of deviations from planned budgets, and of their causes and consequences. In recent years, there have been various attempts to measure budget credibility. The multi-donor Public Expenditure and Financial Accountability (PEFA) program examines budget credibility in its country assessments, by looking at how executed budgets deviate from approved budgets. However, PEFA analysis is performed at a high level of aggregation, and usually examines only the 20 largest budget heads. Budget credibility is also examined in the International Monetary Fund’s (IMF) Fiscal Transparency Code and Fiscal Transparency Evaluations. Some scholars have drawn on PEFA data to undertake their own analyses of budget execution (Addison 2013), while others have collected data at country level to complement what PEFA offers (Simson and Welham 2014; Williams 2015). Nevertheless, there are still gaps in our knowledge about the types of credibility challenges that exist and the extent to which they reflect a broader dysfunction in the PFM system. Moreover, the literature has not investigated in detail two of the most important issues at the heart of how we understand and interpret budget credibility: the quality of the reasoning and justifications behind these deviations, and the allocative or distributional implications of changing budgets mid-year. These two core issues are of the utmost relevance for the broader community interested in budget credibility and are undoubtedly part of the reason why greater attention is being paid to budget credibility today. For example, if the degree to which budgets are implemented is now an indicator in the Sustainable Development Goals (SDG), it is almost certainly because achieving these goals is hampered when countries budget for them but do not implement those budgets. At the International Budget Partnership, we want to understand why this happens (the explanation for deviations) and whether money is being diverted to different priorities than those agreed to in the original budget (the allocative consequences of deviations). The study of budget credibility examines the extent and nature of deviations from planned budgets, and of their causes and consequences. To deepen global understanding of the nature of the budget credibility challenge, with a particular focus on understanding when, where and why budget credibility is a problem, how well budget deviations are justified and explained by governments, and what their implications are for resource allocation and performance in priority sectors. To create and coordinate a global community of practice consisting of civil society organizations, governments, international institutions, and others interested in budget credibility to better understand the challenges. To work with the community of practice and other national partners to identify and promote jointly owned solutions to budget credibility challenges as appropriate. Throughout the two-year research period, the International Budget Partnership will convene and coordinate a global community of practice to discuss the research findings as they are produced and work together toward a set of global advocacy objectives. These meetings will enable the group to build a shared understanding of the causes and consequences of lack of budget credibility and develop mitigating strategies. If you are interested in being involved in the ABC project’s community of practice, please email Guillermo Herrera, Project Coordinator, at gherrera@internationalbudget.org. Ultimately, the Assessing Budget Credibility project—its products and ideas—can help shape our collective understanding of and ways to address problems associated with budget deviations. As part of the International Budget Partnership’s Assessing Budget Credibility Project, 24 civil society partners in 23 countries identified a budget credibility challenge in their country and scrutinized a case where the government consistently failed to raise or spend funds as it said it would at the start of the fiscal year. Partners looked for explanations for deviations in published documents and then sought interviews with public officials to further understand the deviations. These budget credibility country snapshot reports summarize their research. Nigeria has long had severe budget credibility issues, and recent evidence suggests that the problem has not improved. 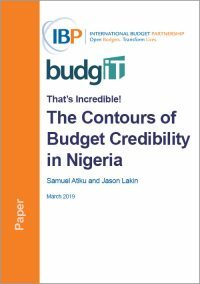 This paper probes the various factors that that may be contributing to the low credibility of the budget in Nigeria and presents an analysis structured around an assessment of eight different hypotheses for what could be driving the problem. This report summarizes budget credibility research undertaken in partnership with 24 civil society organizations in 23 countries between October 2018 and January 2019. Each partner organization identified a budget credibility challenge in their country and scrutinized a case where the government consistently failed to raise or spend funds as it said it would at the start of the fiscal year. Reasons that inform public policy must have certain qualities that make them intelligible to others. 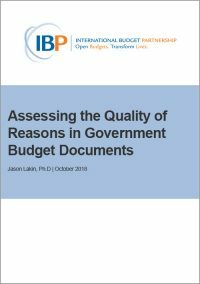 This paper, part of the International Budget Partnership’s Assessing Budget Credibility project, offers a set of criteria for judging both retrospective and prospective reasons governments give for budget choices and deviations in public budget documents. 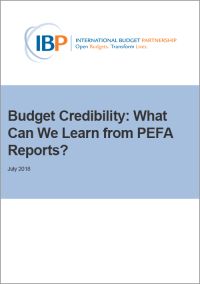 Budget Credibility: What Can We Learn from PEFA Reports? 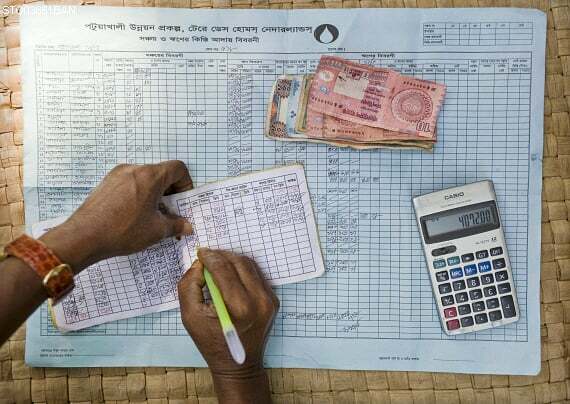 This paper compiles raw expenditure and revenue outturn data for 74 countries using the most recent publicly available Public Expenditure and Financial Accountability (PEFA) reports. The analysis finds that, on average, aggregate spending projections are more credible than aggregate revenue projections; however, the average results hide great variation among countries. The analysis also examines explanations provided for budget deviations in PEFA reports and finds many explanations given are not sufficient. 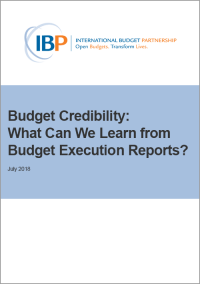 Budget Credibility: What Can We Learn from Budget Execution Reports? This paper approaches the issue of budget credibility from a transparency perspective, looking at the extent to which budget execution reports (In-Year Reports, Mid-Year Reviews and Year-End Reports) include detailed information comparing final outturns to original budgeted amounts for expenditure and revenue, and explanations for any significant deviations. 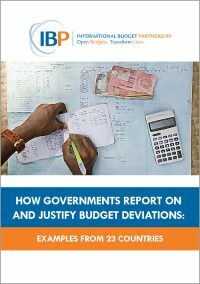 The analysis focuses on publicly available budget documents collected through the Open Budget Survey for 24 countries. 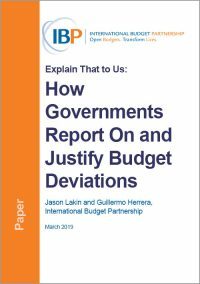 The majority of countries analyzed do provide budget credibility data – in particular in Year-End Reports – but analysis and explanations of deviations are a lot less common. On 7-8 February 2019, the International Budget Partnership convened 45 representatives from government, civil society, international organizations, and the donor community to deliberate on the challenges of budget credibility. The event was designed as a brainstorming workshop to encourage the greatest possible exchange of perspectives and experiences by a wide range of participants.